Our Wild Birds: Apparently Spring has Arrived! Saw something very strange today... something that you only expect to be privvy to with the magic of the television. There was quite a fracas in the birdfeeding station this morning. It took awhile to figure out what exactly was happening. There was this brown ball rolling around, and kinda jumping here and there. 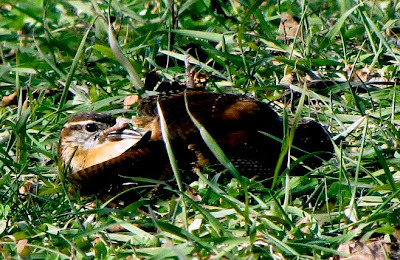 When the ball slowed to a stop, we were able to determine that it was two Carolina wrens having the battle of the century! Right there on the ground! AMAZING! They had ahold of each other with their feet and were rolling and pecking and flapping. It was a once in a lifetime experience. An experience we would have missed had we not been watching our feeding area. 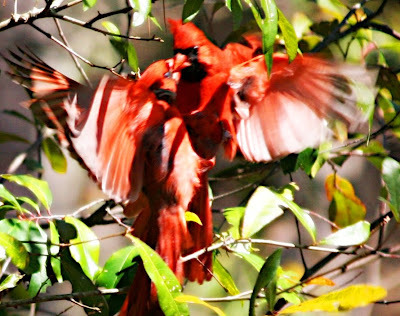 Keep your feeders full and your eyes open, and you too may get to see these rarely viewed behaviors!